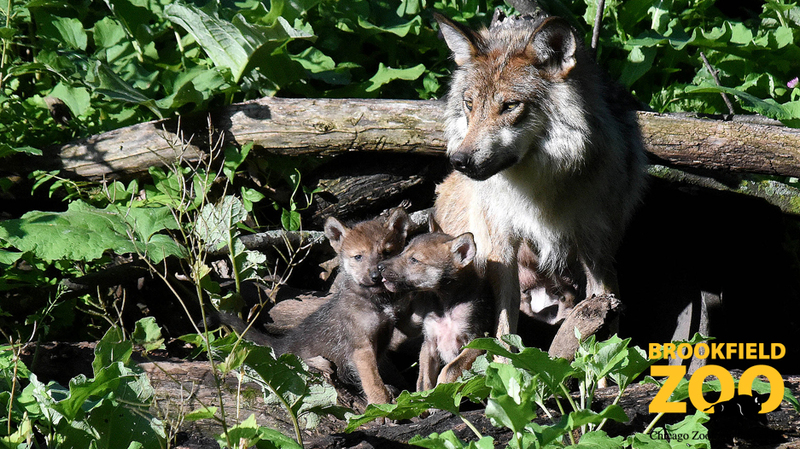 The Chicago Zoological Society is excited to announce the birth of a litter of Mexican gray wolves, who recently emerged from a den site at Brookfield Zoo’s Regenstein Wolf Woods habitat. Born in late May to first-time mother Zana, 3, and first-time father Flint, 5, the puppies are now becoming more active and visible. Guests have a chance to view them along with their parents playing and exploring their nearly two-acre outdoor environment. Chicago Zoological Society animal care staff recently received training from the USFWS at the Endangered Wolf Center in Missouri. There, they were taught proper handling of the pups in anticipation of neonatal well-being exams, which will occur when the pups are six weeks old. This is also when staff will learn the official number of pups born. Although this particular litter was born too late in the season to be a part of USFWS’s pup-fostering efforts occurring with wild wolves, all the puppies are potential candidates for future release to the wild when they are adults. In pup-fostering, very young pups are moved from one litter to another similar-age wild litter so that the receiving pack raises the pups as their own. The technique shows promise to improve the genetic diversity of the wild wolf population. The first successful fostering of Mexican gray wolf pups in the wild included offspring born to a wolf from Brookfield Zoo that was released to the wild.